CLAT 2018 Application Form has been released on 1 January 2018. CLAT Exam 2018 is a national level Law Entrance Exam conducted for the 19 National Law Universities.After registering at CAPS, the next step is to fill the CLAT 2018 APPLICATION FORM online. CLAT Exam Notification has been released by the National Law University in the month of December to notify changes for upcoming CLAT Entrance Exam.Candidates are advised to check CLAT eligibility criteria before the final submission of clat application form. Clat exam is one of the most competitive Law entrance exams in India. To secure a seat in one of 19 NLU's, candidates shall get the complete knowledge of CLAT Syllabus and CLAT Exam Pattern. CLAT 2018 application form can be filled online only. The application form has been released from 1st January 2018. Before you start to fill the form online, register yourself by creating a LOGIN account using an email-id. Remember your user id and password which you have created after the registration. The candidates must pay attention to upload good quality photographs. Poor quality of photographs submitted will lead to rejection of their CLAT application, without any refund of the application fee. The photograph must be in colour and must be taken in a professional studio. CLAT Application Form is available online to fill from 1 January 2018 to 6th July 2018. Read the following step by step process to fill the application form. Click on the official CLAT site - http://clat.ac.in and open the home page. Click on the box - Already Register to proceed further. Enter your registered email id and password sent to you by the administrator CLAT. Then, click on Login box. On clicking the box a new web page opens up. It shows the personal details of the aspirant who has logged in. A careful look at the page shows the box - Go To Application Form on the top. Click on the box to open the application form. In the tab - Personal Details, look at the other Personal Information section. Click on the box shown in picture below to choose state/Union Territory of residence/Domicile. If you are a Specially Abled Person, click on the box shown in picture below to choose an option from the list shown below. If you do not come in this category, do not choose any option from the list. Now fill your gender, region and correspondence address to complete the application form. The fully filled tab - Personal Details is now ready to go to next tab. Click on the box - Save & Continue to proceed further. On clicking the Save and Continue box, a new web page opens up. It show the tab - Qualification Details. Clicking on Grading Mechanism to select either of the two systems shown below. Then, choose the Year of Passing/Appeared for the list. To continue, fill the other details like 'Board/University', 'Max Marks', 'Marks Obtained' and 'Percentage Obtained'. Once you have entered the details, click on - Save & Continue button to complete the tab 2 - Qualification Details. On clicking the Save & Continue button, a new web page opens up showing the tab 3 - Preferences for NLU. In this section, chose colleges as per your preference. On clicking the NLU Preference Choice 1, a list of colleges is displayed as shown below. Click on a college to select as your first preference. Repeat the process of making your choice for other colleges as done above till all the NLU Preference Choice boxes are filled. Click on Save & Continue button to move to next tab, Tab 4 - Document Upload. In this tab section, you need to upload your photo and signature by clicking the link shown below. On clicking the link, a new web page opens up. Under Photograph tab, click on the Choose File button to select your photo. Make sure your photo is in JPEG/JPG format only, max size 100 KB. After selecting the photo, click on the Upload box to upload the photo. Once the photo is uploaded, it is displayed on the screen. You can use the Corp option, if you want to resize your photo. Click on Signature box to continue. After selecting the signature photo, click on the Upload box to upload the signature photo. Once the signature photo is uploaded, it is displayed on the screen. You can use the Corp option, if you want to resize your signature photo. Now go to Exam City Preference section, click on the Select box to get the list of cities. Click on a city to select it. Select the other Exam City Preferences as per your choice. Click on Save & Continue button to proceed further. On clicking the Save & Continue button, a new web page opens up as shown below. It shows the Tab - Fee Details. In this section, you are required to pay the fee online and keep Candidate copy for future use. Follow the steps given in the picture in chronological order to complete this section. On clicking the Submit button, a new web page opens up. It shows the payment fee along with payment options. You can pay by a Visa/Master card credit card, need to choose one. If you want to pay using your debit card, click on the debit card to see the list of debit card types which can be used to pay the fee. Note the payable fee is Rs.4000 only, less than the amount one needs to pay using the credit card. Click on a card type to select it. If you want to pay using your net banking, click on Net Banking to see the list of banks which can be used to pay the fee. Note the payable fee is Rs.4023 only less than the amount one needs to pay using the credit card, but more than the fee one needs to pay using debit card. Click on a bank to select it. If you want to pay using your net banking of bank not displayed on the screen, click on Select Bank to see the list of banks. Click on a bank to select it. Click on the Pay Now button to complete the payment section. Now, click on the Pay Now button to complete the payment process. After CAPS acknowledges the successful payment of the application fee through Online, the candidate will be able to download the completely filled in application form with fee payment details in PDF format. This file can be printed for the candidate's personal records and for further communications. Print out of the form is not required to be sent to CLAT Office. On the submission of application form, the message will appear that the candidate has successfully submitted the application for CLAT-2018. 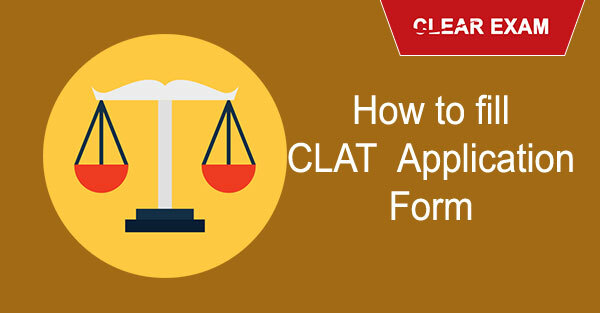 The post will guide you on how to fill the CLAT Application Form. Read it to appear in CLAT 2018 Entrance Exam.